Hundreds of EU citizens marry people from Tunisia every year. This results in a lot of expensive administration and travelling as getting your papers ready for the local embassy and registry office can cause a lot of stress. 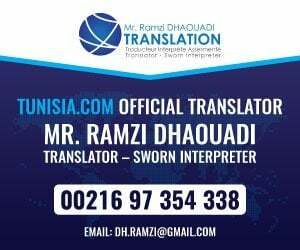 Having a local translator like myself working on your behalf enables you to send me your documents for translation from your home country via registered post to my office here in Bizerte. I can also check with your registry office and ensure that you have the right documentation at the right time. I am also able to translate marriage documents and or clarify marital status and birth dates/names before you sign the marriage contract. Please understand a marriage contract is just that and we advise anyone who is getting married in Tunisia to have a certified translator and a lawyer look over the contract before you sign it!. I can arrange a lawyer for an additional fee for you if required. After your marriage, we can translate your document if you choose to move to Tunisia and our partners at Expat Solutions can help with permits, work documentation and the import of your personal effects. If you intention is to leave Tunisia to live in your home country, we are on the translation lists of many embassies and can translate your paperwork for them to their requirements. Unfortunately, many marriages end in divorce and this can be more stressful if there is an international aspect to the relationship. In many cases if the Tunisian partner returns to live in Tunisia it may be a lot cheaper to divorce here. We are able to work with your legal representative to ensure that either your divorce documentation from outside Tunisia is translated and processed in Tunisia, or to translate and assist you during your divorce application inside Tunisia. Sadly some Tunisian spouses are able to divorce their wives in Tunisia without knowing and in some rare cases clients of ours have discovered that their husbands have divorced them and even re married without their knowledge. We are able to keep in touch by post, email and/or instant messaging removing the stress of such situations and clarifying marital status from the Tunisian registry office.